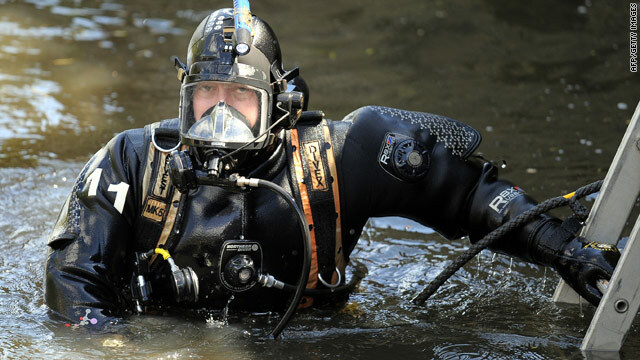 A police diver searches the river in West Yorkshire, northern England, on May 28. (CNN) -- Police in England recovered what they believe to be human remains Saturday near the spot where they recently found the body of Suzanne Blamires, who was reported missing this week. A man who called himself "the Crossbow Cannibal" on Friday has been charged with murder in the death of Blamires and two other women. The presumed remains were discovered in a river on Saturday, about 200 yards from the spot where investigators found Blamires' remains this week, police in West Yorkshire, England said in a statement. They will be forensically examined, the statement said. The police said "it is too early to speculate on who the remains belonged to." Stephen Griffiths has been charged with murder in the death of three prostitutes, court officials said. The three are Blamires, 36; Shelley Armitage, a 31-year-old woman who was reported missing in March and Susan Rushworth, 43, who is last known to have been seen in June 2009, according to court officials. Authorities have not said how the women died. The 40-year-old Griffiths identified himself as "the Crossbow Cannibal" when asked his name in court on Friday. His comment elicited gasps and stunned looks in Magistrates Court in Bradford, about 200 miles north of London, the British Press Association reported.